"Joho! Joho! Joho Tano Tena" People Chanted as Ali Hassan Joho cleared by the IEBC despite fake certificates allegations. - Bana Kenya News, Real African Network Tubanane. Home Mombasa "Joho! Joho! Joho Tano Tena" People Chanted as Ali Hassan Joho cleared by the IEBC despite fake certificates allegations. "Joho! Joho! Joho Tano Tena" People Chanted as Ali Hassan Joho cleared by the IEBC despite fake certificates allegations. 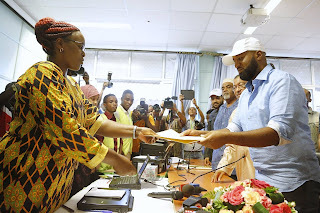 Mombasa Governor Hassan Ali Joho was cleared by IEBC despite back and fourth of his KCSE and Degree certificates. The Mombasa governor now set to be on the ballot on August and urged the People of Mombasa to be responsible and be the ones to decide in August. There was a standoff for about 10 minutes before returning officer Wanjiku Kariuki issued Joho the certificate. Kariuki had requested for the Governor's form four certificate but he refused to present it saying it was not one of the requirements for vying for governor. The Governor further said the fact that he has a university degree is a clear indication that he has a KCSE certificate. It took the intervention of his lawyer to end the standoff but it was not clear what document was issued.There have been claims that the county boss forged a 1992 certificate to gain entry to the University of Nairobi.But Joho said he sat his KCSE in 1993 and scored a D minus. 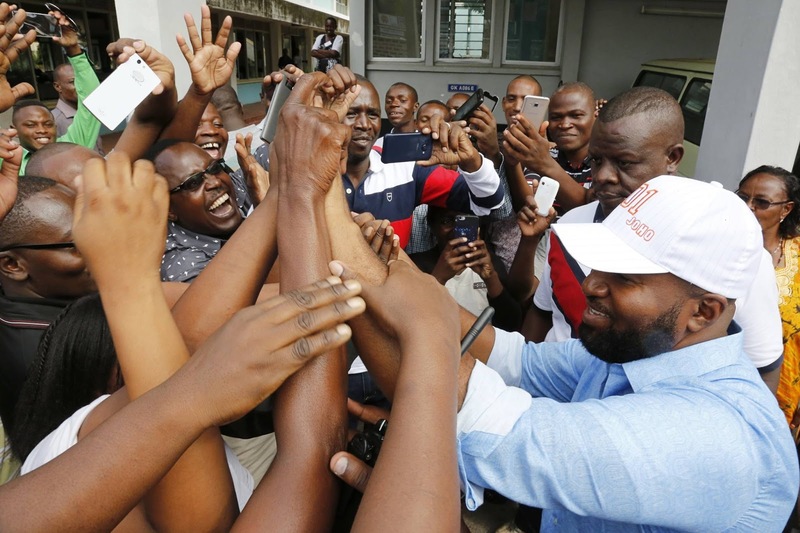 Hassan ali Joho noted he will win the election on August 8. He told a crowd that gathered to celebrate him, thanked God for seeing him through and urged peaceful campaigns. 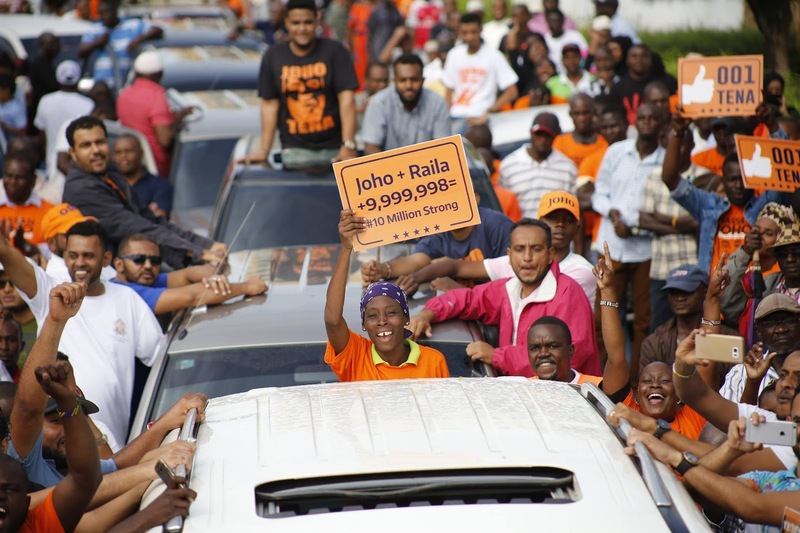 People came with an invite to stand in solidarity with the governor chanting "Joho Tano tena." The Governor is one of 20 politicians an NGO wants to be barred from the poll over integrity matters. Another aspirant who was cleared is Hezron Awiti. The Nyali Mp will be vying for the Mombasa top seat after he decamped Wiper. The other one who will be cleared tomorrow is the Wiper candidate Omar Hassan who will also go for the same seat. "A nation can only be built on truth, fairness, and justice. I give thanks to the Almighty God for seeing me through this journey that has been my life to this point. I thank him for walking with me through the times of joy and for carrying me through times of difficulty. Alhamdullilah!! "Hassan Joho said. "Today, accompanied by my family, my brothers, members of parliament, MCAs, my friends, well wishers and party supporters, I began a new phase of my journey. Our journey." He stated on his social media platforms. "The Regional Office of the IEBC, Mombasa issued me with a certificate to run for Office of the Governor, Mombasa County a second term. I am grateful to the people of Mombasa for the faith they have shown in me for the past five years. I again humbly ask you that we hold hands and walk another phase together. "He added. "Abraham Lincoln once said, "almost all men can stand adversity if you want to test a mans character, give him power". Jubilee has been given power. They have perpetuated inequity and sabotaged regional economies. Their policies have not solved the problems of our people." He stated. "Therefore, yet again, as I ask you to vote for me, I implore you to change the direction of this country. Vote in Raila Amollo Odinga and Steven Kalonzo Musyoka. With NASA/ODM, Mambo yatabadilika!" He concluded.